A couple of years ago, I purchased a copy of Scott Westerfield’s novel, intended for a young adult audience, for my son. Alas, he never read it, but that is not a judgment against the book, as my son tends to read books with video game tie-ins. Since I was assigned a book presentation, (that’s a new term for report, y’all) I pulled Leviathan off the shelf. The book itself is inviting. The cover is amazing in its detail, and the form of the book is slightly non-standard, being just a bit taller and narrower than the norm. The paper is high quality, and the print is just a little wider than normal, which required adjusting the “leading” as the book was formatted for print. Leviathan is an alternate history set in the era of World War I, written for a young adult audience in a genre known as “steampunk,” and is the beginning of a trilogy. The novel has two point-of-view characters, Aleksander Ferdinand, the (fictional) prince of the Austro-Hungarian Empire, who is forced to flee after the assassination of his parents, Archduke Franz Ferdinand and his wife, Sophie. The other point-of-view character is Deryn Sharpe, a commoner, a young woman who disguises herself as a boy so she may join the British Air Service. As the war unfolds, these characters provide insight into two forces in the war. The dualities do not stop there, however, for the British forces of this alternate history have bred various beasts to be both servants and machines of war, such as the Leviathan of the title. The Austro-Hungarian forces rely upon large mechanical warfare machines, such as the walker that Alek has been learning to pilot. From the moment that young Alek is awakened by trusted old retainers, his story is suspenseful, but not unfamiliar. Count Volger guides Alek literally and spiritually toward a safe haven, as he pilots a huge walker, one of his army’s machines of war, as enemies of his father and of the empire seek to kill him. Alek is not on a hero’s quest so much as he is making the transition from innocence to experience. Nevertheless, there are times when he is heroic, such as his efforts to assist the stranded crew of the Leviathan, when it is wounded and lands near his hideaway in Switzerland. By and large, I found this novel to be well crafted, but there are a couple of annoyances. First, the author substitutes words, such as “barking” for another four-letter word that is universally used as a vulgarity these days. Secondly, the initial swapping back and forth between point-of-view (POV) characters was a bit distracting, but after the first chapter, each POV character is on stage until the next chapter. Westerfield alternates his POV characters in each chapter until the two meet upon a barren snow covered mountain, roughly half way though the 400 plus page novel. Alek saves Deryn from being trapped in the snow; then she promptly turns him in to her superiors. He is briefly held prisoner, but the British forces have far more to worry about than a mysterious young man from a mountain village. Ultimately, Alek is released so he can assist the crew of the leviathan, so the prince of Austro-Hungary and the crew of the great ship must cooperate to escape from the approaching German forces. 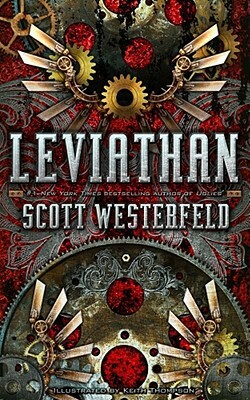 Westerfield’s Leviathan begins with a gripping first chapter and enough action to keep most readers entertained. Although I have not read much young adult literature, this author’s skill is such that I just might read more of his work.